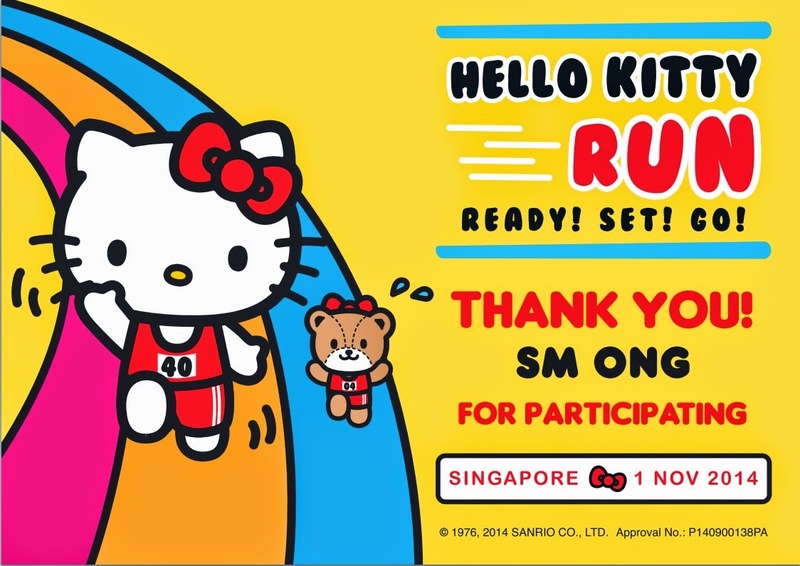 So the Hello Kitty Run happened this morning on Sentosa. My wife and I took a taxi, but there was a jam near VivoCity. We would've been better off taking the train. According to the announcer, there were 17,000 people. 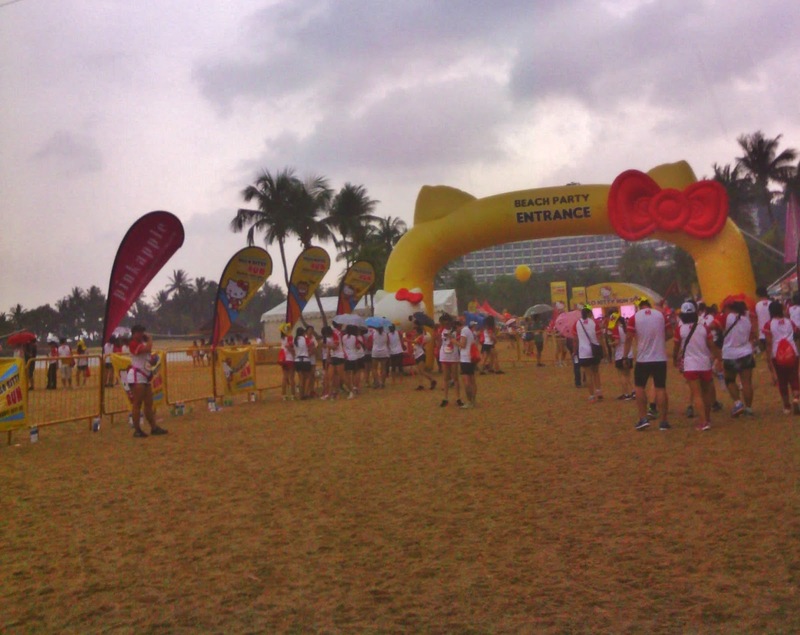 Even though the flag-off was supposed to be at 8am, the runners were released only in waves, apparently for safety reasons due to the huge crowd. I have participated in big runs and this has never happened before. It could be because the route on Sentosa is narrow and many people were stopping to take photos. Anyway, what this means is we didn't cross the start line until after 8:15. Actually, it wasn't much of a run. It was more of a walk-a-jog. And it wasn't 5km as advertised, but around 4km to the finish line. Fortunately for us, it started to rain kitties and dogs only after we finished the run - I mean walk-a-jog. This was about as close as I got to the "beach party" because of the rain. 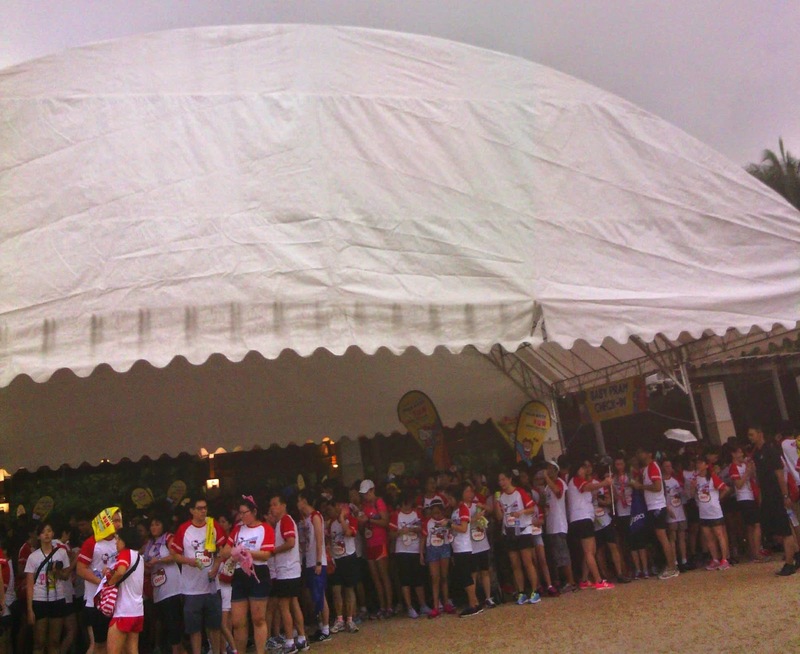 Many stayed under the shelter. We walked in the rain to the Beach Station to take the Sentosa Express train back to VivoCity at around 9.30. By that time, the run was put on hold due to the weather "until further notice". We were lucky that at the beginning of the run, we had made our way to as close to the start line as possible. 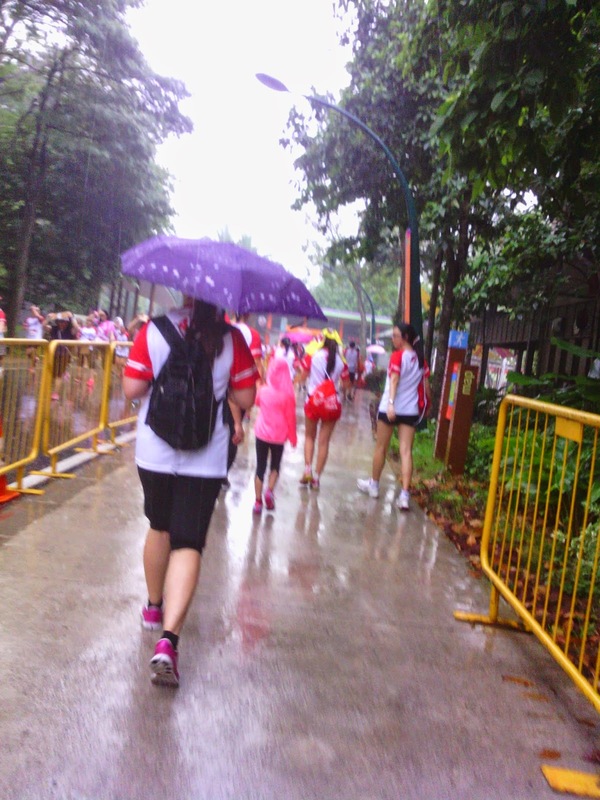 Because of the rain, I think many behind us didn't get to run (or walk-a-jog) at all. 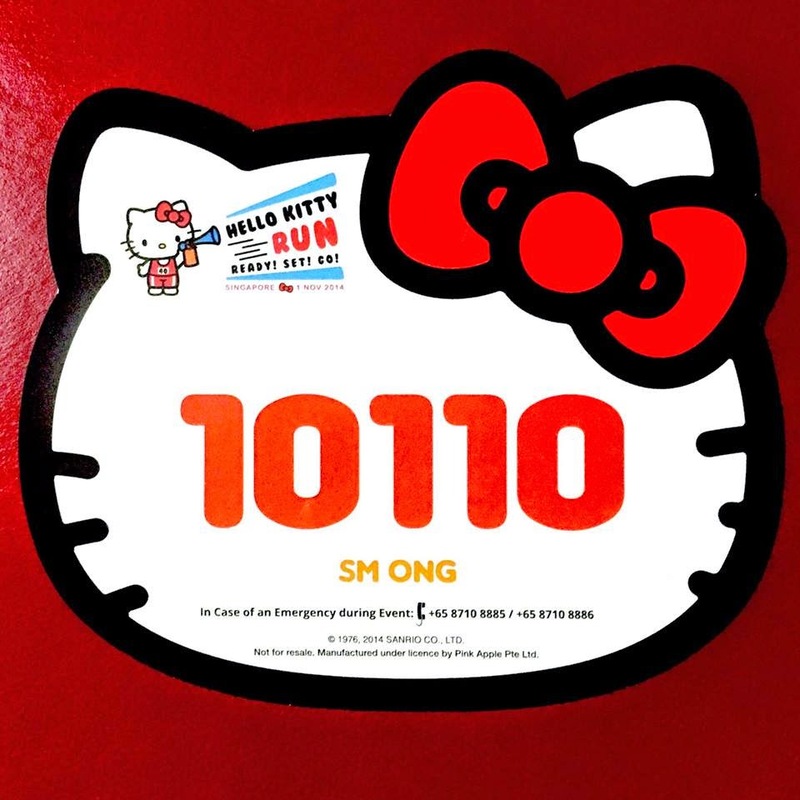 On the Hello Kitty Run Facebook page, you can find many complaints about poor organisation. The main one is that there weren't enough finisher medals to go around. Apparently, some people took more than one. There wasn't a system to prevent this, based on what I saw. My wife and I got ours. I can understand why many are unhappy with the event. I paid $65 for it. Others as much as $75. That's a lot of money for a 5km run (actually a 4km walk-a-jog). You got the T-shirt and a plush toy in the race pack, and you were promised a finisher medal. So you want that finisher medal - even if you didn't get to finish the run because of the rain. And that's why someone went to the trouble to make this. 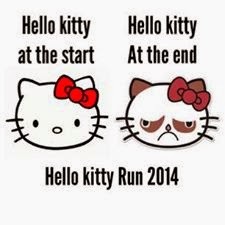 It's a good thing I only like Hello Kitty ironically.